Fennel meets endive and decide it’s a match…on top o’ the stove! 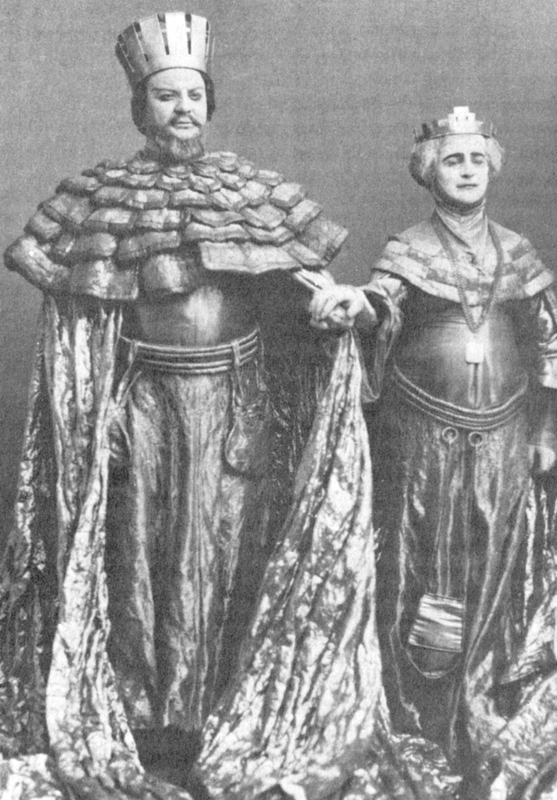 Russian actor Nikolai Massalitinov as Claudius with Olga Knipper as Gertrude, fully braced for “troubles”; in the Moscow Art Theatre production of Hamlet–a few years ago! First it was the TV–no picture from the UK– satellite dish has to be larger now to receive the BBC; then the temperature control on the oven called it a day and now neither of the keys will open the car doors electronically. And to cap it all in this catalogue of woes (or self pitying monologue), three recipes I was hoping to write up turned out to be duds! Not exactly a battalion of troubles compared to this horror the folks in Cornwall have been facing. But enough to tickle the imagination and set off a search for alternatives. French TV or a good book/internet stuff by the fire? No contest for much of an evening. Top o’the stove to ye all me ‘arties! Last night I remembered the spicy dal in the fridge from a couple of nights back–firm enough to form little patties to fry lightly in olive oil. I had spotted some locally grown endive yesterday at Castres market–those torpedo shaped lettuce that intrigue, but can flummox too. What to do with them other than add to salad? This recipe from my new book, Healthy Eating for Life, suggests cooking them in the oven. But no working oven! I excavated one good fennel bulb left in the fridge too. This recipe for pot-roasted fennel from my first cookbook, Delicious Dishes for Diabetics, sautés them slowly on top o’ the stove. Solution: cook ’em together–on top!! Sweet fennel, plus the faint bitterness of the endive, finished with squeeze of lemon. I halved the prepared endives lengthwise to shorten the cooking; then browned them in two fluid ounces of olive oil on a medium flame, uncovered, with the fennel (sliced top to bottom in 8 pieces) and garlic (unpeeled), for ten minutes. Added four fluid ounces of water to the pan and cooked the mix–covered–for a further twenty minutes–until the vegetables are tender. 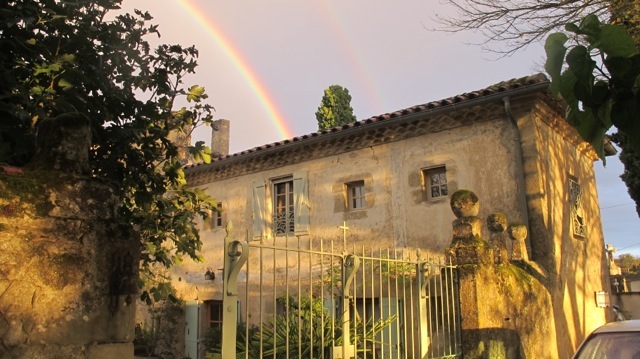 We dined last night reflecting on how lucky we are to live in a rectory between a church and cemetery, on a rise where the rain runs downhill bypassing us. We say it often: The ancients knew a thing or two about where to build their sacred spots. really good, and very easy, which I like. I like a lot. Yes these troubles always seem to in three’s don’t they .but with a cunning plan you can out wit them. Someone I use to know always said that the best place to buy a house was half way up a hill. When I asked why he said that you are just out a waters reach, and you only have to climb half way up. Hope you get your T.V. and oven working again soon. Thanks Elaine! You had a wise friend! I was interested to see you live near a church and cemetery, Robin. So do I, although mine is only about 150 years old. I actually love old cemeteries and enjoy visiting them. So many people seem to dislike and fear them – it’s posed a real estate problem for us!